Each frame is .1 seconds apart. Aaron Peirsol's new world record set in this event was 1:54.66. This view is from the swimmer's left side. The previous analysis for this section of the Swimming Science Journal is a companion to this one and looks at the swimmer from his right side. Frame #1: The right arm begins to execute an up-and-inward sweep to initiate its exit from the water. Turbulence coming off the arm shows the development of drag forces by this action. At the same time, the left arm has entered the water fully extended (although it looks like it might be partially hyperextended) with the hand flat and behind the shoulder. Kicks occur throughout this sequence in the same manner as that described in the previous analysis of Aaron Peirsol in this race (at 135 m). The streamlined position of the swimmers shoulders through to the hips is excellent. Frame #2: The left wrist immediately flexes and the hand rotates to a backward orientation. There is no downward sweep, just an immediate attempt to begin pulling the swimmer forward as soon as the hand enters the water. The up-and-inward sweeping right arm shows turbulence completely along its back surface validating the propulsive forces that are generated by this action. Frame #3: The left elbow begins to flex as the swimmer repositions his arm to have as much arm surface as possible at right angles to the intended line of propulsion. Power for the left arm is generated by adduction of the upper arm. As the right arm exits the water, the swimmer's body rotates to the left to place the propulsive movements of the left arm in a better position to develop direct propulsion. If that rotation were not to occur, the lower left arm and hand would emerge above the water's surface if the same movement was preserved. Rolling the body cancels out potential vertical movements of the pulling arm and produces direct propulsion. Frame #4: The full left arm presses against the water in a very direct manner. Adduction of the upper arm causes some lateral movement of the propulsive "arm system" but that is counterbalanced by other movements (primarily the kick emanating from rotated hips causing some lateral forces to be developed). Frame #5: Full left-arm propulsive forces are produced. Frame #6: Full left-arm propulsive forces continue, although at this stage effective upper arm abduction is finishing and extension at the elbow is beginning. Frame #7: The left arm extends back and slightly down (due to elbow extension). Frames #8 through #14: The actions of the left arm up-and-inward sweep and the right arm in its propulsive phase are better seen and explained in the previous analysis. 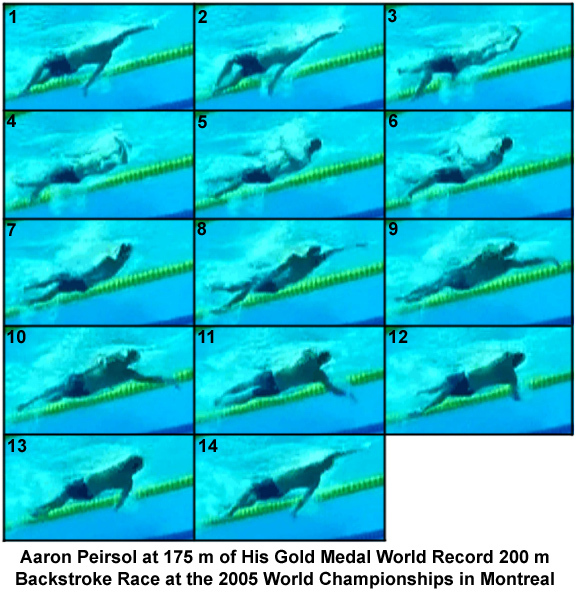 Aaron Peirsol's stroke is reasonably symmetrical in terms of propulsion developed and actions exhibited by both the arms and legs. There are features in his stroke that should be instructed to young swimmers once they have developed a reasonably stable backstroke form. Those features contradict teachings from yesteryear that continue to persist in many swimming programs today. Roll the body to each side during the arm-pull to cancel out potential vertical arm actions and to produce a very direct propulsive force application. The hand should be flat and on the back at entry. As soon as the swimmer feels contact with the water, there should be an immediate attempt to orient the hand backward, which involves wrist flexion, and arm and shoulder rotation. The swimmer should not attempt to make the entered arm go unnecessarily deep. The arm is swept as a unit directly backward. The swimmer should feel a surge being produced by the total arm (i.e., have the swimmer concentrate on developing propulsion from the mid-lower-arm up to the armpit instead of only the hand). To maintain the correct orientation, the thumb should always be directly on top of a "square-on" hand throughout the full stroke. The first part of the hand to exit the water should be the thumb, a movement completely opposite to the out-of-date concept of exiting the water little-finger first. The up-and-inward sweep in the last phase of the stroke should produce propulsion that should be felt by the swimmer. If the swimmer does not pitch and rotate the hand to the appropriate angle, the arm will simply cut through the water to exit. That would lose a valuable part of the length of the propulsive phase of the arm in this form of competitive swimming. Streamlining of the shoulders-hips is very important ("keep the hips up on the surface").